Lethargic Cat Not Eating - What Might Be The Cause? 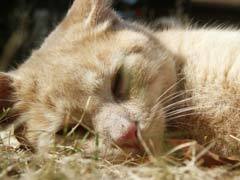 Lethargic Cat Not Eating – What Might Be The Cause? A lethargic cat can sometimes be a difficult thing to spot, since they’re naturally less energetic than dogs. Lethargy can be a sign of serious problems, so it is best to take note of such behaviors. Is the cat less apt to jump to his favorite spots? Does he avoid contact, or hide in unusual spaces? These can all be sick cat symptoms, in some cases of serious disorders or life threatening illness. A lethargic cat after vaccination is a fairly common side effect of cat vaccinations—in addition to vomiting, fever, or sneezing. Although an owner should still keep a close eye on their lethargic cat for several weeks, any side effects should pass naturally. Of more concern is a cat not eating. In this case, a lethargic cat is lethargic because of lower blood sugar levels. General weakness, or trembling follows cat loss of appetite, and the reasons a cat stops eating are many. It could be it dislikes a change in diet, there are environmental stress factors affecting the cat, or there could be an injury or illness of the teeth or mouth. In other cases, it may be an internal illness or disorder that is causing the cat to avoid food and thus weaken it. Feline leukemia, kidney or liver disorders, pancreatitis, or anemia can weaken the cat and deter it from eating. When a lethargic cat refuses to eat or drink, this is of serious concern and should be addressed by a vet immediately. The best way to prevent more serious illnesses from affecting your cat is to watch its normal behavior, and respond to drastic changes by seeking medical attention.